OLD PARKED CARS. 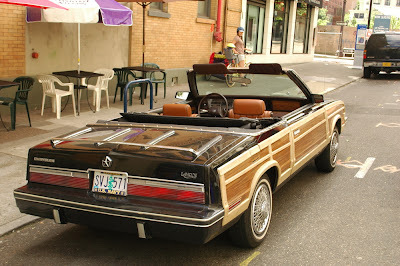 : 1983 Chrysler Le Baron T&C Convertible, Mark Cross Edition. 1983 Chrysler Le Baron T&C Convertible, Mark Cross Edition. Who the heck is Mark Cross? Some self-proclaimed fashion guru from the early 80s? Or lee Iacocca's nephew? 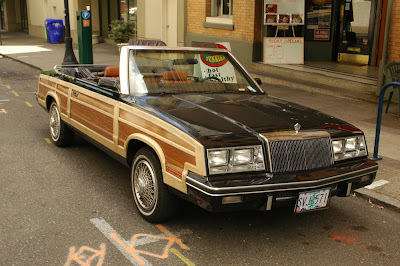 Emilio Estevez's character in the awful 1985 Brat Pack fest "St. Elmo's Fire" drove one of these. I can't decide whether this is a masterpiece or monstrosity. Probably somewhere between, like most cars. This early 1980s incarnation of the Lebaron often elicits an unusually strong reaction, however. I think what irritates me most about this car (and so many American cars of the 70s and 80s) is that they are so easily and obnoxiously able embrace the low speed impact "diving board" bumpers and moronic dual-fixture headlights, because the cars are already so ugly that such backwards attributes fit right on, whereas sophisticated European cars like the 1972-1989 Mercedes SL "R107", were almost completely ruined by such forced additions. Still, within the sad, narrow design philosophy that created this car, I admit it somewhat works, which is why I even contemplate the possibility of success. Speaking of the Mercedes R107, this car always reminded me as a great rip-off version. The proportions are tight, neat and angular, and I like the simple horizontal rear tail-lights. The colors on this cover quite a spectrum of tan-to-brown earth tones, including that saddle interior. Overall, a strange, mixed footnote. Somebody better click that Like button, pronto. Had to ad the K Car tag as well. Crazy back end, the tail lights combined with the combination of fonts is amazing. This is definitely working for me, every inch is some kind of fun to look at. 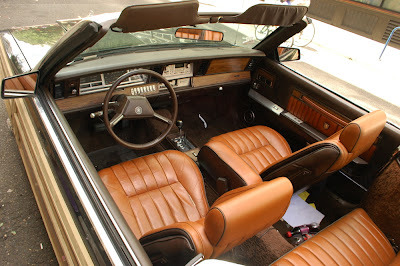 "America's First Luxury Leather Good Brand"
Some good memories associated with a T&C LeBaron (with the 4-cyl turbo). I took a christmas tree home one year by folding the top down and sticking it in the back seat. Hi! Are you selling it?? 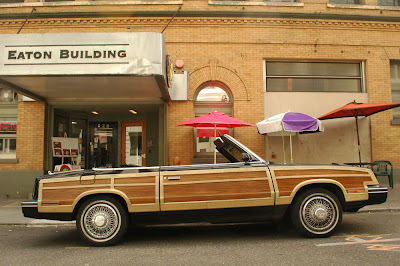 It's my dream car! Please let me know. I have one identicle ready to sell. It was my Dad's, garage kept.